Unnaturals: The Battle Begins is the first book in a new science fiction series by Devon Hughes. This Amazon review from School Library Journal sums it up pretty well: “Lion’s Head is the setting of this dystopian novel in which the rich live sequestered behind thick glass up in the sky away from the poisonous environ- ment down below. The poor live in squalor in the Drain and make do with the synthetic food that is available. Mayor Eva Eris keeps the denizens entertained with her Mega Monsters Mash Up, a reality show where mutant animals face off against each other in the arena. The reining champ is the Invincible, a hybrid tiger-scorpion who is true to his name. 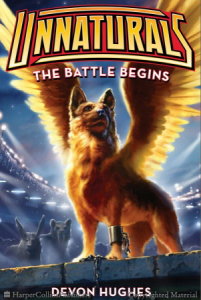 Castor, a German shepherd stray, becomes an unwilling member of Team Scratch after he is kidnapped by humans and redesigned with eagle wings and a new name, The Underdog. Castor had been content living with his dog pack and dreaming of the Greenplains, a natural wonderland. He does not want to become the killing monster his human handlers expect. With the help of a Chihuahua-spider mentor named Pookie, Castor looks to his inner strength to survive his ordeal and to win out against the machine that put him in this predicament.” It’s available in paperback from Harper Collins.